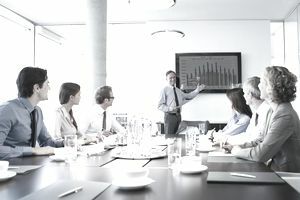 Because a business presentation is meant to inform, motivate, and create a call to action, PowerPoint is commonly used in business meetings as an aid to the topic at hand. Despite the proliferation and simplicity of this visual aid, time after time the misuse of PowerPoint technology ends up detracting from the original intent of the meeting. You can create and deliver a powerful PowerPoint presentation if you understand the four cardinal rules of terrific PowerPoint presentations. The first broken cardinal rule of effective PowerPoint presentations is forgetting the intent of the software. PowerPoint isn’t a word document program or a means for dumping data on an audience. If you cut and paste text from a written document into the PowerPoint presentation, that's a surefire method for alienating your audience. The biggest mistake presenters make is taking on the role of the writer as they proceed to read the content in the slides. Keep in mind that you're the "presenter" not the orator and your job is to wow your audience by connecting with them as you guide them through the slides. Simplicity is at the heart of every good business presentation. People do not want, nor can they absorb, a lot of information at one sitting. Consider the unfettered look of the Google homepage or the clean and simple design of the iPad. Both have created a passionate fan base. To move people with your business presentation, your PowerPoint needs to evoke emotion with simple, yet powerful messages and images. Less is always more when delivering a top-notch business presentation. The old saying “a picture is worth a thousand words” cuts to the heart of effective PowerPoint presentations. Hubspot's 25 Best PowerPoint presentations all feature more graphics and fewer words. Also, each of the presentations used compelling original images, not boring generic clipart. Remember, even though PowerPoint presentations contain data such as facts and statistics, people see presentations, they don't read them. To create a memorable presentation, you need to go beyond the expected. Stirring up controversy or challenging the beliefs of your audience is one method for waking them up and keeping them engaged. Chip and Dan Heath are the authors of the bestselling book "Made to Stick: Why Some Ideas Die and Others Survive." If you heed their advice, you'll elevate your presentations to a higher level while engaging your audience. If we want to motivate people to pay attention we should seize the power of big surprises. Break patterns, create mystery, build unique stories, and find knowledge gaps. The unexpected equals attention. Not everyone is a born public speaker. Even the most accomplished business people can experience stage fright when addressing an audience. In these cases, the presenter tends to read from notes and not make eye contact with the audience. This is a recipe for disaster. To wow your audience, don’t use the PowerPoint as a note toll. Take the time to familiarize yourself with your topic and touchstone points that comprise your presentation.